Some months ago I stood in a basement bookstore in suburban Maryland and pondered a relic of the 1960s, an artifact of dubious worth to the casual observer which had suddenly brought tears to my eyes. How that shaggy, worn green carpet had managed to slink through the decades without being conquered by the reign of the new and improved fascinated me. Objectively it did not offer instant aesthetic pleasure; there could be no dispute about that. Yet here was an ancient truth: deeper than the fleetingness of fashions and fickleness of desire runs a capacity for love rooted in attention. Perhaps we may go about the mundane tasks of living while, unbeknownst to us, we have been investing our time and care transforming the ugly Beast into a Prince. Perhaps love is born not of attraction, but of attention; and attention requires space for such communion. Deeper than the fleetingness of fashions and fickleness of desire runs a capacity for love rooted in attention. Walking through the maze-like rooms that cold November afternoon it became clear my fondness for this footworn carpet was awakening me to the miracle of the entire enterprise; though it had changed names and owners, it seemed ludicrous this basement store still existed at all. For decades it operated in the shadow of both a Barnes & Noble and Borders. 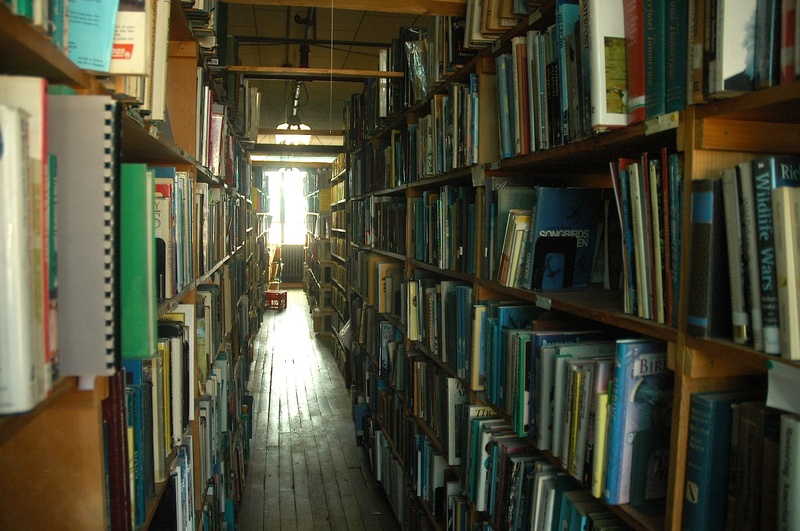 Many of its used-bookstore brethren had closed their doors. Not only that, but it was situated in a wealthy, endlessly re-developing area not known for excessive sentiment towards decaying strip malls. In fact, it was in an area where book-reading itself is something of a status symbol, the kind of identity-marker one intentionally “makes known” through Pinterest posts and t-shirts. 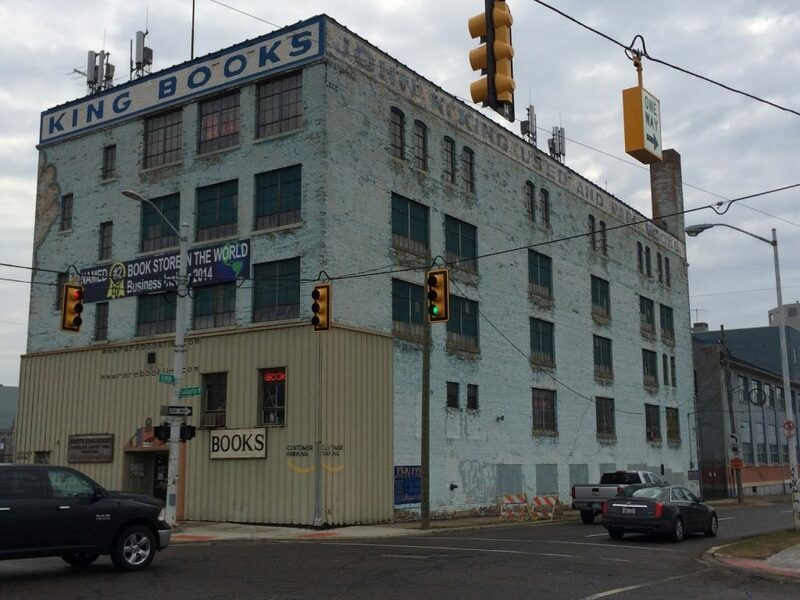 While overall the community bookstore has been in a state of collapse for some time, it has not escaped notice that something of a reversal and renaissance seems to be underway. Usually unasked, though, is an important question: a renaissance for whom? Any truly prosperous neighborhood in any city of this country will not be complete until it can boast an independent shop which sells letterpress cards for seven dollars a pop and thirty-dollar baby onesies with Ruth Bader Ginsburg’s stoic face over the word “DIVA.” Sometimes these places sell books written before 1990, and they come in lush, colorful collector’s bindings. Books here are lifestyle accessories; content comes second or third, if it comes at all. By staying the same these places take a gamble: they prize curation, preservation, and staying put over Instagram-appeal. But what of bookstores celebrating the used, the much-loved, the recycled classics, handed down through generations? What of the bookstore that takes a risk and dares to engage in highly selective curation of used books, knowing there is a significant chance no customer interested in a 50-year old copy of Peter Berger may pass through the doors for years or decades? They could guarantee the rent payment if they moved to a place with more foot-traffic or invested in Harry Potter wands. By staying the same these places take a gamble: they prize curation, preservation, and staying put over Instagram-appeal. Do not doubt the boldness of these choices. Many of these places have not just shelves but entire cases devoted to philosophy, history, and, most daring of all, theology. They could dump those books in the garbage, fill the walls with gadgets and cards, and perhaps guarantee themselves a little breathing room. They don’t do it; why? Perhaps because these owners share in common something of a sacred mission: to catch the physical arks of our collective memory before they are swept to sea by digital-everything. They’re stewards, choosing to shoulder a weight when the mainstream pushes weightlessness and speed and punishes those who cherish the permanent things. What does the preservation of a place through so many years and trends tell us about time and change? It is in these spots, willing to show that the years lie heavy on it indeed, that we can distinguish one place from another. The lines on one elder’s face are different from the lines on the next, and in that is time’s beauty which makes us human. The owner’s decision to accept those wrinkles, to develop distinguishing grooves and crow’s feet rather than slipping along on polished plastic surfaces into the world of sunny amnesiacs is rebellion indeed. These bookstores can grow moss. Moss is not something our economic or cultural values comprehend. 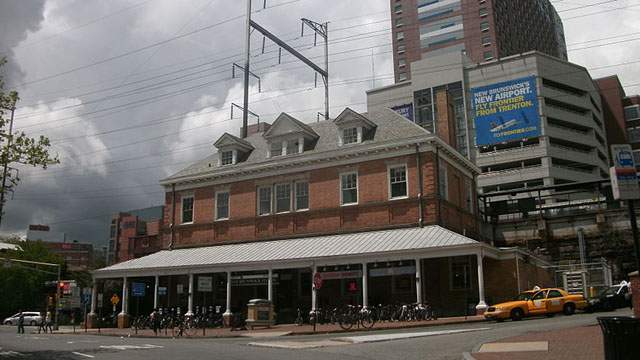 Roughly a year ago I stood in the New Brunswick train station in New Jersey, the oldest train station building left on its feet in a state always eager with the wrecking ball and ready to throw up a Wawa (though we all love Wawa). While my husband purchased tickets I walked over to the great arching windows to look at the landscape of my former home, then clasped my mouth in shock. I had had no doubt I would see what I expected to see, and yet I was wrong: a chasm was ripped in a heartbeat between my memories of the world and the way it lay now. Across the street had stood a landmark as familiar in its way as my parents’ faces: a dark brick parking garage, its yellow sodium lights gleaming at all times, in all weathers. The lights had vanished. It lay demolished, crumbled into dust, not even given a proper grave site of honor. It was mere rubble to be cleared from sight in favor of a new shopping tower that crowed its dawn from a banner above the work site. It was progress, and it was desired; who was I to mourn? Tears came quickly and I tried to dash them away but to little avail. Perhaps other rootless mid-Atlantic denizens will understand the intensity of the reaction. We moved away from New Brunswick when I was a little girl, though I returned for college and have had various reasons to spend time there over the years. The town never lost the mythological qualities I gave it as a small child, though they are increasingly difficult to preserve as the town becomes unrecognizable. Down those gloomy Dickensian steps from the train station, water dripping from the heavy stones even during droughts, my father would come bounding to the car carrying his wife and daughters from what I imagined to be the neo-Victorian horrors of Wall Street, where Oliver Twists starved over smoking subway grates (how little I knew of Gordon Gekko’s New York). That parking garage was one of the things that made me me. Family homes were sold, beloved grandparents died, partings were made permanent. Nothing survives, nothing endures; a Hungarian restaurant run by an immigrant grandmother from her basement was devoured by the hospital; the bookstores were shuttered; the famous food trucks were wrecked to make way for yet another variation of the coffee-and-internet chains. All the gritty charm, the rough surfaces that made each corner a little different than the next, and thus more akin to a handmade patchwork quilt than a synthetic blanket from Target, had been sanded smooth and made indistinguishable from everywhere else. There’s almost nothing now to distinguish New Brunswick from Montgomery County, Maryland, and the problem radiates up and down the coasts and across the heartland. The same shopping centers and signage grind down the quirky particularities of our individual memories. A highway exit in Montana is the same as a highway exit in New Hampshire is the same as a highway exit in Appalachia is the same as a highway exit in West Texas (oh but this one has a Buc-ee’s, quick, pull off here). Now even my parking garage was gone, the parking garage I’d run from in the rain to a final exam, where I’d parked my car before every trip to NYC, where I’d curled up in the backseat with a broken heart, where my mother had parked to take me to the doctor’s office as a 4-year old, craning my neck in hopes of spotting the McDonald’s. Faulkner and Fitzgerald can say what they will about the past being always with us, but Americans seem to want nothing more than to tear it down and set up another granite-countered franchise. We have a little fondness for the musty old bookstore that’s been there for 30 years, but then buy a Kindle all the same, and millions of us sit down night after night with those indistinguishable screens beaming the same blue light at us from coast to coast. No sentimental introspection as to why they picked this edition of Pride & Prejudice over another; personally I cannot imagine reading any other version than the emerald Bantam Classics edition. Why? I don’t know. Do Kindle readers wonder about such things, or is it all utilitarian arguments about which version makes for the most efficient reading? Perhaps I’m the outlier; in general, people seem to like it this way and accept the trade-offs better than I do. I wonder, though, if perhaps the change doesn’t pain them because they grew up a little less rootless and don’t quite realize how much topsoil has been carried away; maybe their children will realize the barbarous waste of it all and will develop a corresponding soft spot for preserving their own favorite parking garages in this here amnesia-land. The green carpet has withstood what brick and stone did not. It is moss in a land of rolling stones, and moss is what I’ve looked for all my life. Where did the immigrant grandmother who ran her restaurant from her basement go when the boulders came crashing down? The qualities that make for moss, that turn green-carpet clad strip-mall basements into beloved homes, were what my eye sought whenever I had cause to wander around America. Looking past the identical condos thrown up in every town, one can still find the dizzying and terrifying prairie of Willa Cather’s Antonia. While Air BnB races to turn the French Quarter into a permanent rental space for the rich, there are still a few shadowy oyster bars Walker Percy’s Binx Bolling would recognize. Despite our best development campaigns, some things have been spared the wrecking ball. On my trips it was the bookstores woven into a neighborhood that seemed the best way to enter into the life of a place, to the extent that any traveler can really do that. The good ones had been made into homes for moss which spoke their story: what the people had cared enough to preserve and what they had been unable to save from ruination. The ones that have survived these first onslaughts of digitalization are living archeological sites. As much as a po-boy can and should tell you about the history of New Orleans, these days you can easily procure one even in an old steel town like Pittsburgh. It’s the dim aisles of a bookstore in the Quarter, the walls and shelves so heavy with memory that they have become like the live oaks, where I can begin to imagine what it once meant to be born, to live, to suffer, to love, and finally to disappear in New Orleans. Hyper-centralization, the newness of all things, has changed the landscape of the world. How long will mossy bookstores last, and with them, how long will an America not built solely for the fashions of the wealthy last? Their tastes increasingly dictate what anyone anywhere can consume. We seem to have reached an impasse in creating wealth quickly enough to satisfy our greed, and so we instead create illusions of it by shifting goods around. Usually this means extracting wealth from one place to bring it to another, and our largest cities celebrate themselves with projects and opportunities built out of the broken dreams of dying towns. Hyper-centralization, the newness of all things, has changed the landscape of the world. It has changed who can do business. It has changed who is allowed to do business, who is allowed to turn their life into a lifestyle, and who are the disposable, forgotten people. The result is a concentrated trend towards monolithic consumption. Perhaps it is unfair and we should celebrate any and all bookstores, but the uniformity of the celebrated hip, new, independent bookshop signals something amiss to me, a desire to swim in shallow waters of safe reassurance. It is bookstore as spa-experience I dread to find, a therapeutic, signaling bookstore for the wealthiest people who want to be confirmed where they are. What social status is to be gained from owning a frayed edition of the poems of John Donne, when you can signal your social desirability through this morning’s printed collection of Instagram poets? It looks so perfectly minimalist beside a bowl of rocks on the coffee table. Moss does not appear to be economically useful or good in the age of lifestyle brands. As we increasingly make a world that shrugs off the concerns of the losers in the Darwinian struggle, we also make it impossible for them to hold onto the places that give their homes meaning. Say goodbye to the used bookstore on Main Street; the town has been hollowed out, and they can’t pay the rent. Take comfort, enough wealth has been extracted from you through the new Dollar General in your town that someone in San Diego will be able to sell Clairefontaine notebooks, albeit to people who will still only use their smartphones. But they’ll make a great backdrop on social media, and that should keep you warm at night. The discrepancy between the two bookstore scenes should be a field of study for intrepid sociologists and anthropologists. Compare Ann Arbor and Detroit. How much there is to learn between these two cities just an hour apart by car! Between these two places we witness the abyss which opened up between the lower and upper-middle classes. Once they dwelt side-by-side; then the one was ground into the dust and condemned as wealth consolidated itself and escaped down the highway. Surely there is no small or mid-sized town in this country which can equal Ann Arbor’s magnificent bookstore scene. Used and new alike, every store is worthy of a visit and there are an easy half-dozen within walking distance of each other. It is a virtual paradise for readers, and I am grateful it exists. An hour away, though, in what the motorist may at first take to be another abandoned warehouse, sits the John K. King behemoth. It is a shabby and weary giant overlooking the drearily empty highway. Here is the wreckage of a civilization, an echo of Rome hollowed-out after the sackings. Floor after floor of creaking joists and broken windows unevenly patched with saran. Snow still blows through and mercifully offers repose to a stack of missals in a stairway corner. It’s cold and damp, and the women who work there don many heavy layers to protect themselves from chest infections. The visitor walks through a cavernous dark room and hears a sudden click and turns fast. A mouse? Worse? With a sigh of relief, one sees a hanging bulb glowing in the distance. It’s too expensive to keep the whole place illuminated all day, so guests pull the chain when they want to browse a section and yank it again when they leave. There’s a theology section; good grief, it’s not a theology section but an archaeological expedition. Every parish hymnal, every schoolchild’s book, has been scooped from the houses before they were demolished and crammed into these sad shelves. Names etched in ballpoint ink, lessons from good little children marked up. Where are these good little children now? Did they escape and make it to stroll the sunny streets of Ann Arbor, forgetting the other little children left to grow old and rot on the dying streets of Detroit? The injustice of it makes the heart ache. The store is a great witness to the savagery of the post-World War II pax Americana, where some buy leather-bound books as home decor, and others lose their homes, their memories, even their silly parking garages. We’ve made moss preservation a Herculean task. 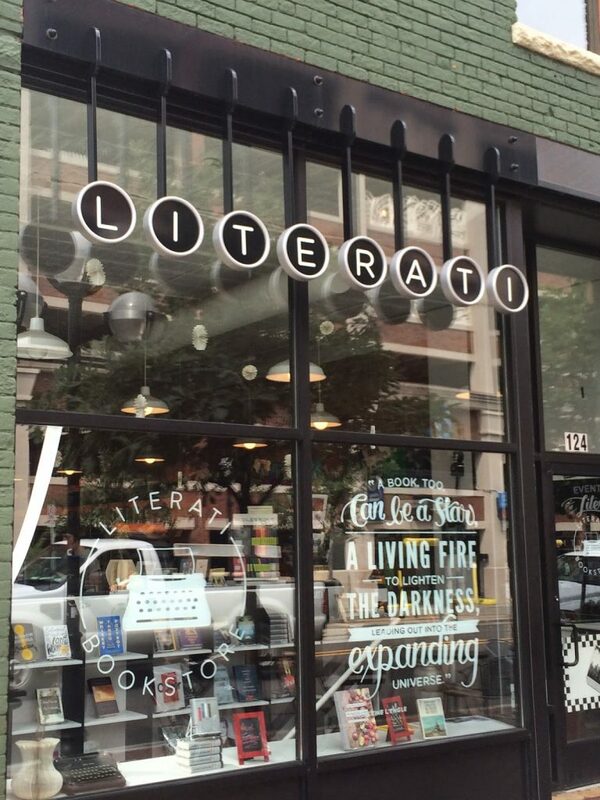 Later this week, a follow-up post will list 30 of America’s best local bookstores. 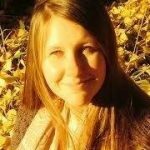 Tara Ann Thieke is an armchair amateur helping to build communities from her home in Western Pennsylvania. She is currently serving as President of the Board of Trustees for Imago Dei Politics after a decade of working around the country as a caregiver. Found: The Perfect FPR Presidential Candidate! I was prepared not to like this piece. As someone who has spent 35 years in most aspects of the bookstore business, I-feel-like-I-know-something. But that chip was easily removed from the shoulder in the second part of the essay. The colonial stripping of resources from the core to the bright periphery, the creation of the sameness and disposal of the unique, succinctly summed up some of the issues we face. I can’t wait to see the list, if only to harrumph about why you didn’t include…. Please don’t talk like that. Don’t say that people have to “escape” their hometowns to go off to university, never to return. Ann Arbor has thrived and Detroit has floundered due to conscious decisions made by the “elites” of America, to tell generations of children that they are losers unless they move away and go to university (and take on lots of debt, etc., etc.) before getting a job, rather then finding a job locally, or starting a business of their own even; to funnel vast sums of money to university towns while at the same time pursuing policies that destroyed domestic manufacturing companies; to destroy towns and cities all across the country with “urban renewal” project; etc., etc., etc. Thanks for the comment Brian. The ‘escape’ was sarcastic, I hoped the rest of the piece showed my frustration for the willful destruction of Detroit by the wealthy, and their later abandonment after they’d devoured everything they could take. Just to be clear, there are two “Brian’s” commenting here on your post. Yes, I clearly read the piece too quickly and uncharitably. My apologies. PS. Local bookstores are like punk bands and surf spots. The best ones are of course not ones you’ll have ever heard of or know how to find, unless you’re in the club, ha ha. Would you please tell me the name of the long gone cottage book store on Cape Cod? I have been on the Cape since 1990 but began selling book in 1969. Chamblin Bookmine, Jacksonville Florida – the Roosevelt Bldv location for shock and awe and the downtown location for rainy afternoons.